The second, annual Coventry & Warwickshire Business Festival (CWBF) has drawn to a close at The Slate - a prestigious conference, meeting and events business based at the University of Warwick. At this finale of the Festival, guests celebrated the past two weeks which in total, saw over 100 diverse business events and nearly 3500 attendees, 25 per cent of whom (from those booking through the Business Festival) came from outside the region. There was a huge range of events on offer that were well-received by attendees, with 96 per cent of people rating those they attended as ‘good to excellent’. All nine of the Business Festival sectors spanning Automotive and Advanced Manufacturing, Business and Communications, Construction and Property, Creative and Digital, Education, Games Development and Serious Gaming, Health and Wellbeing, Professional and Financial Services and Tourism and Culture were represented. More than 1,100 different businesses took part by sponsoring, running or attending events and 86 per cent felt that the Business Festival positively affected their business. Out of the many outstanding events were the CWLEP Growth Hub’s ‘The Fourth Industrial Revolution – why should you care?’ – a great afternoon spent debating the future of automation and technology in business. The Coventry & Warwickshire Chamber of Commerce held their largest speed Networking event to date on Wednesday 28 November welcoming nearly 200 guests. The feedback was fantastic with several requests for a repeat event to be held soon. A high-profile morning about trading with India run by the WMG and the Growth Hub on Friday 23 November featured significant speakers from Government and business and received international recognition. Coventry University’s ‘Wellbeing and Productivity in the Workplace’ in partnership with Santander was designated ‘Event of the Festival’. In addition to being well-attended, it was well-organised, the content was topical, informative and interesting, the speakers were well-rehearsed and captivated the audience. The ‘Most Engaged Business of the Festival’ accolade went to brand agency, Glued from Leamington. As well as running a sell-out and well-praised event, ‘Build Pride in Your Business’ about motivating staff and engaging customers, Glued carried out a comprehensive marketing campaign and were generally very proactive and engaged with the Festival, attending many other events. 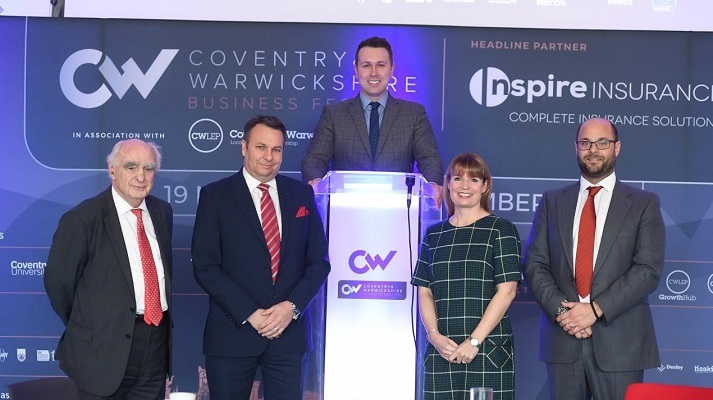 The CWBF was initiated by the Coventry and Warwickshire Local Enterprise Partnership and the Coventry and Warwickshire LEP Growth Hub and it has been headline partnered in 2018 by multi award-winning insurance broker, Inspire Insurance. Jonathan Browning, chair of the Coventry and Warwickshire Local Enterprise Partnership (CWLEP) said: “The second Coventry & Warwickshire Business Festival has been a fantastic success, providing the platform for businesses in all sectors to hold a wide range of events which have been stimulating as well as informative. “I spoke at the Festival opening and attended a fascinating event on driving more trade with India which not only attracted a very high level of speaker, but a quality audience and had some very positive messages for companies to act upon. "Coventry and Warwickshire is the Knowledge Capital of the UK and we have a host of ground-breaking developments and initiatives, and being able to share those with a wider, but locally engaged audience, is very valuable. Craig Humphrey, managing director of the CWLEP Growth Hub, said: “The Festival has certainly made its mark in the Coventry and Warwickshire business calendar and the community is truly embracing this brilliant fortnight of business. Through such a comprehensive programme of quality events, we have raised our heads above the parapet showing the world that Coventry and Warwickshire is the place to do business and is a beacon for investment. Neil Mackey, commercial account executive at Inspire Insurance, said: “It’s been our first year as headline sponsor and we feel that that the Festival has provided us with a fantastic platform to not only showcase our brand to the region and beyond, but also it has created lots of opportunities to network, meet new people, build new leads and grow our business. In addition to headline partner, Inspire Insurance, the business festival has been partnered by Coventry University and the University of Warwick and sponsors have been thefutureworks, CUE Business Solutions and the MTC. Business Festival supporters included RDM, The Deeley Group, Tisski, Coventry City Council, Warwickshire County Council, Coventry City of Culture and the district councils of North Warwickshire, Nuneaton & Bedworth, Rugby, Stratford-on-Avon and Warwick. Media partners included Business & Innovation magazine, Elonex and Cross Productions. Official App partner is Infonote Datasystems and the Festival is managed by Associate Events. For more information, visit www.cwbusinessfestival.com, contact hello@cwbusinessfestival.com or 0247 601 1447.